A fugitive activist known for attacking Japanese whaling vessels off Antarctica insisted “we’re not pirates” Wednesday as he addressed a U.S. appeals court considering whether he and the organization he founded should be held in contempt. 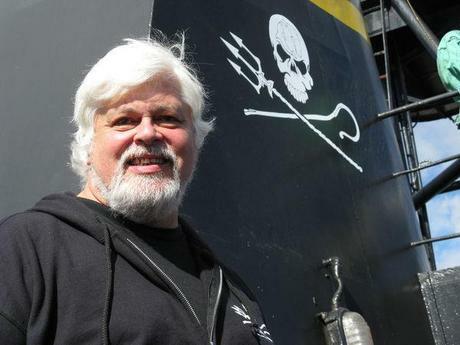 Paul Watson, the Canadian founder of the Sea Shepherd Conservation Society, took the witness stand in a Seattle courtroom. Japanese whalers accuse them of violating a court order demanding that they leave the whalers alone. The white-goateed 62-year-old described his history of environmental activism and accolades, and said he’d spent the past year at sea. He fled Germany in 2012 after being arrested at the behest of the Costa Rican government, and Japan continues to seek his arrest related to his interference with a whaling vessel in 2010. “Over the last year there’s been a lot of negotiation on different levels that allowed me to come ashore,” he said, in response to a question from his lawyer. Watson did not elaborate, and it remained unclear whether he might still face arrest. The case is part of a long-running fight between the protesters and Japan’s whaling fleet, which kills up to 1,000 whales a year, as allowed by the International Whaling Commission. Japan is permitted to hunt the animals as long as they are killed for research and not commercial purposes, but whale meat not used for study is sold as food in Japan. Critics say that’s the real reason for the hunts, which they view as illegal. For several years, Sea Shepherd operated anti-whaling campaigns in the Southern Ocean. Activists aboard its vessels would hurl acid and smoke bombs at the whalers and drag ropes in the water to damage their propellers. They claim they have saved thousands of whales. Last December, just before the whaling season was to begin, the 9th U.S. Circuit Court of Appeals ordered Sea Shepherd Conservation Society, Watson and anyone acting “in concert” with them to keep a half-kilometre away from the whaling vessels. The Japanese whalers argue that the organization violated that order 10 times early this year, including the deliberate ramming of a fuel ship by a protest vessel. Sea Shepherd denies that account, saying the protest vessel was simply trying to block the refuelling of a whaling ship when the whaling ship boxed it in. The whalers asked the court to impose fines of $100,000 for each violation, though they suggested the court waive those fines as long as the protesters stop confronting their ships. In response to the injunction, Sea Shepherd says it withdrew from any participation in the anti-whaling campaign, and Watson stepped down from the organization. Instead, Watson and Sea Shepherd said, its cousin, Sea Shepherd of Australia Limited, took over — and that organization insists it wasn’t subject to the court’s order. The hearing in Seattle, which began last week, is aimed in part at determining whether the Australian organization carried out the protest in concert with Sea Shepherd. The whalers argue that the distinction between Sea Shepherd and its Australian counterpart was largely fictional: Sea Shepherd had spent about $2.5 million preparing for the protest, including the cost of fuel and ship crews eventually used in the protest. Watson, whose exploits have been featured on the Animal Planet reality television show “Whale Wars,” insisted that it was important for him to comply with the injunction — but by the time the injunction was issued, he was already on board one of the protest vessels. He remained only as an observer, he said, and at one point urged Sea Shepherd of Australia to abide by the court’s injunction. During cross-examination, John Neupert, a lawyer for the whalers, suggested it was odd for Watson to resign from Sea Shepherd — and his overall command of four protest vessels — when if he had remained in charge he could have ensured that the vessels complied with the injunction. Watson said he didn’t believe he could have ensured compliance with the order. The captains of the ships were likely to intervene if they believed a whale’s life was at stake, he said. He fled from Germany last year after being arrested at the behest of the Costa Rican government, which is pursuing him on a warrant that claims he endangered a fishing crew in 2002. He has said he believes the arrest was made under pressure from Japan, and that he eventually would have been extradited there had he remained in Germany. Jeff Hansen, director of Sea Shepherd of Australia, testified Tuesday that his organization did not co-ordinate with the American Sea Shepherd group after the injunction was issued. He said he does not believe the U.S. courts have jurisdiction over international waters — “No disrespect, of course,” he told the court. And he vowed that no matter what the U.S. court rules, his organization will forge ahead with plans to challenge the Japanese whaling fleet early next year. “We’re answering to our clients, which is the whales,” he said.